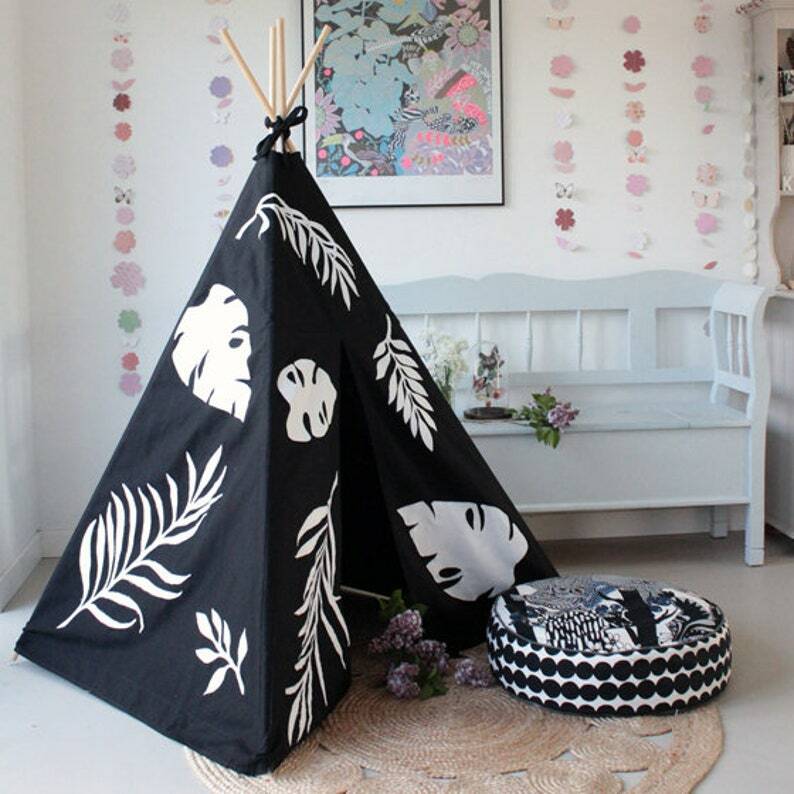 Stunning limited edition indoor play teepee tent. 100% cotton drill base cloth in jet black with appliqued large white cotton drill tropical leaves for a eye catching graphic look. 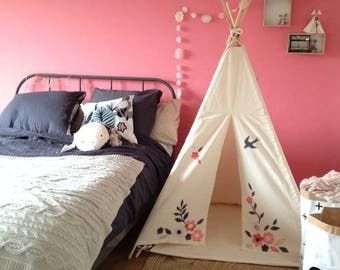 Super stylish statement teepee for all you desgin lovers. Make a designer impact with this teepee. Great for girls or boys of all ages...and even pets! The teepee has a removable (washable) fabric floor mat (just seen). Comes with, long tie for the poles and drawstring storage bag. This teepee has no window. This super special design is made to order. Leads times vary, please get in touch if you need this teepee by a certain date. 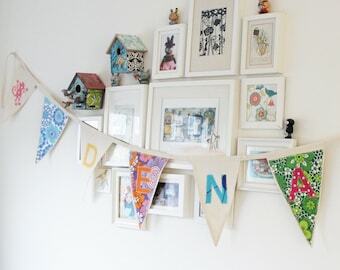 Bunting flags can be purchased separatley. If you are unsure which size to order and have space for the MIDI size I would recommend getting the MIDI as it will last your child longer as they grow and you can fit inside this one with your child for story time and games, also great for play dates and sibling play. Height approx 185cm / 73" to top of poles. (165cm when inclined). Approx 105cm / 41.3" square when erected. Mini teepee (shelf) is exactly what I was looking for!! this teepee tent is so beautiful and simple, exactly what I was looking for. the boys (age 3 and 1) fit at the same time and love it. easy to set up. very good customer service and quick delivery. 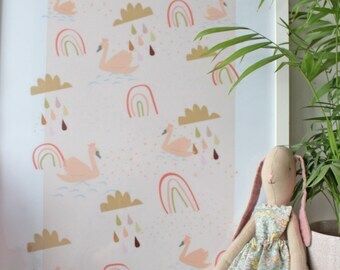 YOU CAN PLACE YOUR ORDER DIRECTLY VIA ETSY.COM, and use Paypal payment, you can do this even without a Paypal account (and pay by card or e-cheque). IF YOU ARE NOT COMPLETELY HAPPY WITH YOUR DELIVERY PLEASE notify us via email and then SEND IT BACK TO US, at your own cost IN ITS ORIGINAL CONDITION WITHIN 14 DAYS FOR A REFUND. If the fault is on our behalf we will also refund your postage. Items lost in the mail will be refunded but we need to know about them asap, we send too many parcels to be able to track each one, but if you need help with the tracking please ask :) Missing parcels are often due to incorrect delivery addresses, please make sure the address on your Paypal is your current address :) Deliveries do not need to be signed for but it may be best to use a work address. WE USE INTERNATIONAL TNT.nl REGISTERED MAIL SERVICES FOR OUR DELIVERIES. This is the Dutch International postal service, please note that once the parcel is in your country is is then in the hands of your regular postal service (eg. USPS in the USA), and will arrive with your regular delivery person. You will be sent tracking info with your shipping notification via email to the email address on your Etsy account. Rest of the World - 2 to 4 weeks (US customs can hold items from the Netherlands for up to 2 weeks). There is now an expediated shipping option upon request. 24hrs delivery within the EU - 2 - 3 days worldwide (in most cases), the cost is added if you request this service, an additional €60 worldwide. WE CAN NOT ACCEPT RETURNS ON ANY CUSTOM MADE ORDERS - ie TEEPEE ORDERS WITH PERSONALISED DETAILS, NAMES ETC UNLESS THERE IS A FAULT WITH THE TEEPEE ON OUR BEHALF.